The following list highlights some of the principles that we believe are most helpful in creating and sustaining intimacy. Some of these principles are counterintuitive. 1. The foundation for ongoing sustained intimacy comes from partners being able to explore, appreciate and presevere in managing differences rather than similarities. Almost everything is predicated on this first principle. After an initial bond is formed, the intimacy potential in a relationship will always remain low if couples avoid exploring their differences and contradictions. Without this exploration, differences and contradictions become walls and barriers instead of bridges. When partners adopt the attitude that a difference is something to be explored, they create an open system and become genuinely curious about themselves and each other. Differences are the pathways to strengthen the individuals and the partnership. For most couples, the significant growth and evolution started out as conflict, disagreement, or abrasiveness. Those couples who tolerate and use the conflict are able to deepen their intimacy. 2. Progressive levels of self definition and self disclosure will stimulate increasing levels of fear and anxiety. People rarely know themselves deeply and reveal themselves openly to their partner, especially when they know they will face disapproval, disagreement or anxiety from their partner. Also as time progresses some of the observations are inevitably feelings of inadequacy, bad habits, or critical thoughts about the other. The implications often make the person feel very uncomfortable. It can be compounded by the partner's side-stepping or not even hearing the expression. Neither partner wants to discover what's displeasing in themselves or unattractive in the other. The greater the self disclosure, the more likely it is that people learn what they don't like about the other – or themselves! The more of these that are uncovered the more it creates anxiety about how to stay married to someone you don't like or don't respect. Bad sentence, how about this instead: Deeper levels of such self disclosure increase anxiety about staying married. It is even more unusual to find a partner who can pursue intimacy when they feel threatened by aspects that are emerging in their partner. To do this in an ongoing way requires a mature ability to conduct tension filled discussions without personal concerns, interests, opinions and defensiveness. 3. Moments of greatest defensiveness are not to be avoided. They provide some of the best opportunities for intimacy with self and intimacy with the partner. Ironically, tension filled moments of defensiveness offer some of the best opportunities for increased closeness to develop. However, due to the “law of unintended consequences,” one partner's defenses elicit defenses in the other. Then the other naturally reacts. The most common defenses are blame, withdrawal, confusion, resentful compliance and feeling like a victim. These defenses lead people to create pinhole perspectives. From the pinhole perspective, they get locked into their way of viewing the problem. This “tyranny of the partial perspective” becomes oppressive for both. The tyranny will persevere until one or both become more open minded. But relinquishing the defenses is not the goal. The defenses are natural reactions designed to reduce and minimize threat. They are developed in the family of origin and supported by the personality and temperamental style that each person inherited. In order to facilitate the development of intimacy, these defenses must be managed-put aside and converted to an open curiosity. They must be converted to an ability to ask questions during situations of high tension. Each partner must be able to develop the ability to explore what we call their own web and the web of their partner. The web consists of values, goals, fantasies, concerns, interests and core beliefs about self and other. 4. In the absence of differentiation a core orientation may develop. Each person often makes the entrenched decision about the other. They may also solidify negative beliefs about themselves. He's selfish and never interested in what I feel. She's so self-absorbed – all she cares about is herself. All I ever get is crumbs. I give and give and sacrifice myself and there's still nothing there for me. I made a mistake when I married you. I can't handle my partner's anger. You'll never ever give to me. 5. The foundation for arriving at ongoing, more sustained intimacy is achieved by countering our natural instincts for self protection and self preservation. As the discussion evolved and they were able to explore more deeply, it became clear that Cindy had made the plans to give Jack a day alone at home as he had been requesting. Furthermore he had been helping to cook dinner for their friends when the plans were made. He recognized his core belief, “People won't like me just for me – unless I'm doing something for them (cooking).” When the plans were being made, he couldn't include himself because he felt unwanted. Secondarily, in his marriage, he was angry at Cindy rather than appreciative that she actually wanted to give him the free day he had requested. That would counter a core decision, “no one will give me exactly what I want.” Being angry at Cindy was actually more comfortable and familiar than feeling tender and appreciative of her for giving him time off. 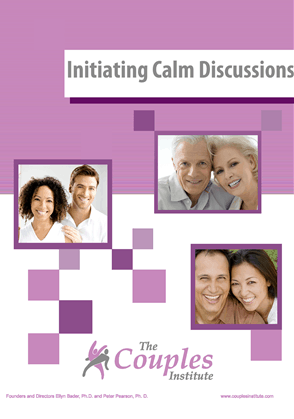 For more information on intimacy visit Therapists' Resources. Our book “In Quest of the Mythical Mate” contains thorough discussion of this complex subject. Great article! Is it possible for you to add one of those buttons that allows you to forward to a friend. I would love to forward some of these articles to couples I work with but I don’t see any easy way of doing it electronically. Thanks. Great stuff here! But… a bit densely written for the clients I work with — a lot of them don’t read much! I’m reworking it into a simplified handout that I’d LOVE to share with you when I’m finished.